Although the number of units in the field is still small, solar photovoltaic (PV) powered pumping systems offer many advantages over the more traditional technologies. Because there are few moving parts, maintenance is reduced to a minimum, and reliability is very high. Also, because the time of greatest water demand usually coincides with the maximum daily solar energy, the available pumping power is well matched to the demand. This guide is written for the potential user to give a simple background to PV pumping technology and to help to identify the situations in which solar pumping should be considered. The early chapters act as a guide to those unfamiliar with PV pumping, illustrating typical applications, and reviewing current technology. Following this are sections dealing with the range of currently available equipment and examining experience in the field. The final four sections cover the practical aspects of choosing pumping system. This includes site evaluation and system sizing, a simple methodology for an economic assessment, and advice on procurement, installation, and maintenance. 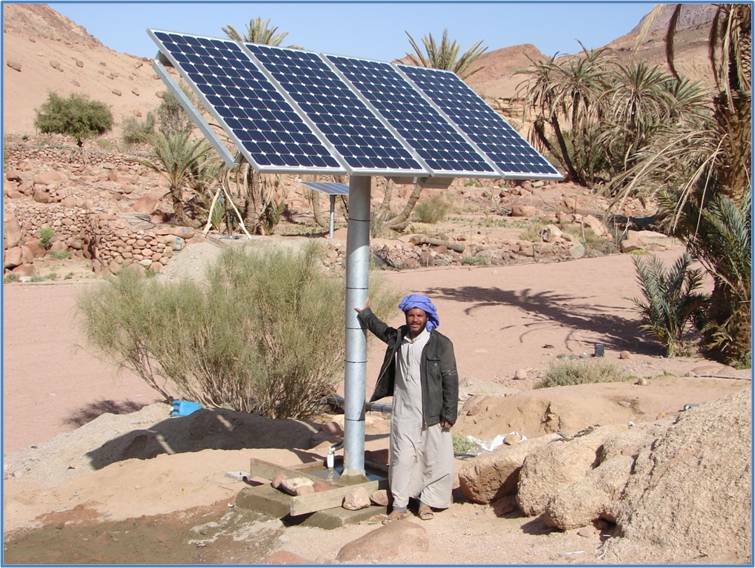 Abstract: A solar submersible pump system which uses photovoltaic cells as the power source has been developed. This system comprises a 4-inch, deep-well, submersible pump and a solar controller. A PMSM (Permanent Magnet Synchronous Motor) is used as the submersible motor. Upgrade in system efficiency and compactness were achieved by the application of an exclusively high-speed design. The solar controller features an exclusive MPPT (Maximum Power Point Tracking) control function. High reliability is realized by a dry run protection function, in addition to the normal operation protective function, with full consideration given to the system's use in remote areas.